Tender, subshrubby perennial with branching stems of softly hairy leaves, evergreen in mild climates, strongly aromatic when crushed, with a sweet fruity scnet like melons. Narrowly tubular, bright scarlet-red flowers in summer. 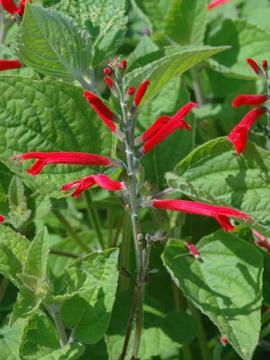 Similar to Pineapple sage, but slightly smaller growing and flowers earlier. Fertile, well drained soil in full sun or a little shade in hot climates and a warm sheltered position. Quite tender and needs winter protection, although may survive short periods of a few degrees of frost. May be used as a flavouring herb or to make tea. Collected in Jalisco, Mexico by Fred Boutin in 1968, introduced to cultivation by Huntingdon Botanical Gardens, California.